Purchase Point Australia is the fusion of two industry leading promotional companies into a single purchase point, to provide Australian organisations with a complete promotional marketing solution. Our new direction is to be the driving force in the supply of promotional products, apparel, team wear, graphic design, point of sale material, logistics and direct indent with our offshore partners. We truly are a one stop shop for all your promotional marketing needs. 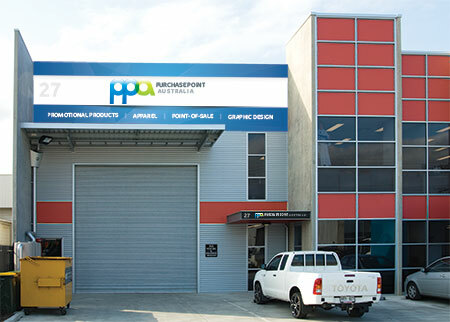 With a history as two of the most successful promotional products companies in Australia, the PPA personnel have over 60 years collective experience in the promotional and marketing industry. The merge has given us the opportunity to expand on our services including state of the art warehouse and tracking, national warehousing and distribution, electronic ordering systems, plus a stronger online aspect to our business. Our increased buying power is also reflected in our competitive pricing from both our local and international supply base. Purchase Point has built a reputation for quality product supply and on-time delivery. Our national clients are our credentials and our many advocates have worked with us since day one. We have a total promotional solution which includes innovative concepts, creative design, product sourcing, warehousing, distribution, reporting and back-up service and support. Purchase Point is a member of the Australian Promotional Products Association (APPA) and is a multi-award winner for their promotional products campaigns. Purchase Point has a dedicated team of professionals who go that extra distance to offer clients the ultimate service and attention. A well trained team will not simply sell you a standard product off the shelf, but rather, will listen to your requirements and work with you to achieve and exceed your promotional objectives.